The Basics: An adaptation of the hit musical (which itself was an adaptation of Victor Hugo’s mammoth novel), Les Misérables tells the story of the people of France in the decades following the French Revolution. The story centers on Jean Valjean, a man who served 19 years as a prisoner for stealing a loaf of bread before starting a new life with a new identity after breaking parole. During the course of the film, Valjean finds himself the caretaker of a dying young woman’s daughter, Cosette, while always trying to stay one step ahead of Javert, a relentless officer of the law. As years pass, Cosette grows up and falls in love with the revolutionary, Marius, one of a group of impassioned young men who stage an uprising that is met with tragic consequences. While not a perfect adaptation, Hooper’s vision manages to actually improve upon the source play by making the big musical moments profoundly personal and all the more heartbreaking. Anchored by brilliant performances from both seasoned veterans and new faces, Les Misérables is an emotional tour de force. M.V.P. (Most Valuable Performer): Without a strong actor in the role of Valjean, no version of Les Misérables can survive. Thankfully, Hugh Jackman is more than up to the task. His singing is predictably strong, but what especially struck me throughout the film were his eyes. He manages to convey so much depth of emotion in the slightest change in expression, giving a nuanced portrait of one of the most iconic characters in modern musical theater history. Valjean is a complex character who undergoes huge moments of spiritual and personal transformation as well as physical transformation, and Jackman shows each stage in this character’s development with perfect balance. He was powerful when it was necessary, but he was also equally compelling in quieter moments, which made his Valjean feel extraordinarily raw and real for a character from a musical. I was going to save Anne Hathaway for the “Scene Stealer” portion of this review, but there can be no denying that she stands alongside Jackman as the most valuable member of this cast. I was a bit skeptical because of just how much praise she was getting, but I can honestly say that she lives up to the hype and then some. There is no way that words—even the most eloquent—can describe her rendition of “I Dreamed a Dream.” It’s a truly transcendent moment; I felt afraid to breathe as she sang—that’s how transfixed I was by her performance. Done in one take with the camera focused on nothing but her emaciated, tear-stained face, this song is the epitome of all that is good about this film. It’s achingly raw—her eyes are wild, her nose is running, her tears are audible in every note sung—but it’s impossible to look away. There’s a moment near the end of the song where it looks as if she’s having a panic attack while singing, and I’ve never felt more gutted by a performance in a musical. And that’s exactly how I wanted to feel, how I needed to feel in order for this film to have the impact on me that it had. Scene Stealer: I had never heard of Eddie Redmayne before going to see Les Misérables, and now I can’t imagine the film without his performance as Marius. I know this is a word that tends to get overused in reviews, but he’s a revelation in this film. His Marius isn’t just the lovesick schoolboy of some versions of this musical. There’s a passion, strength, and depth in Redmayne’s performance that makes you care about this character and truly feel all of his joy and then all of his pain. There’s a tragedy to Marius’s arc that can sometimes get lost in his seemingly happy ending, but Redmayne never lets you forget that this is a young man who will forever be haunted by what happened on the barricade. The way his entire demeanor changes from confident and strong to broken and guilt-ridden absolutely broke my heart. His “Empty Chairs at Empty Tables” is all I could have asked for from my favorite song in Les Misérables. It was sung beautifully and with an honesty of emotion that only a great actor—perfectly cast in this role—could have delivered. Most Memorable Scene: It’s impossible to pick just one. The most memorable moments in the film—the ones that have stayed with me long after I left the theater—are scenes that took Tom Hooper’s decision to have the actors sing live and use it to elevate the songs to new levels of emotional impact. The first such moment is Valjean’s impassioned “Who Am I?” Jackman sells Valjean’s crisis of conscience in this song with a depth and power that’s all the more affecting because it truly feels like he is examining his soul rather than singing to the back of the house. The way it begins quietly, almost as a whispered conversation with God, makes the crescendo even more stunning. I’ve already said all I could put into words about Hathaway’s “I Dreamed a Dream.” Redmayne’s “Empty Chairs at Empty Tables” was a moment of nearly equal emotional power for the same reasons—the naked vulnerability, the tears, the way the song builds from quiet loss to desperate pleading. And Redmayne and Samantha Barks’s duet, “A Little Fall of Rain,” is perhaps most successful at using the medium of film to add new power to the music of Les Misérables. The gentle intimacy between the two actors could not be achieved by projecting like in live theater or by using a pre-recorded track. You feel immersed in the tragedy of this moment because it’s happening right in front of you—from the way Barks’s voice believably fades as she nears her death to Redmayne’s strained delivery of each lyric, as if Marius is trying but failing to keep his grief at bay until she’s gone. Strengths: The greatest strength of this film is the talent of its cast. Their ability to not only sing but also deliver incredible acting performances shows that Hooper’s choice to have them all sing live was the right one. In addition to Jackman, Hathaway, and Redmayne, I have to give special credit to both Barks and Aaron Tveit for their performances. Barks makes Éponine’s big moment—“On My Own”—another standout scene in the film. She expertly shows how Éponine goes from hope (her smile when she sings, “…and he has found me”) to panic (her fear when she sings, “Without me, his world will go on turning”) to acceptance all within the course of that one song. Tveit not only gives a strong singing voice (one of the best in the cast) to Enjolras; he makes him a figure of both impassioned charisma and heartbreaking gravitas. There’s a moment during “Drink with Me” where you can see on his face the realization that his friends could die, and he carries that weight until his tragic end (which is made even more tragic by the stoicism he gives Enjolras in that moment). 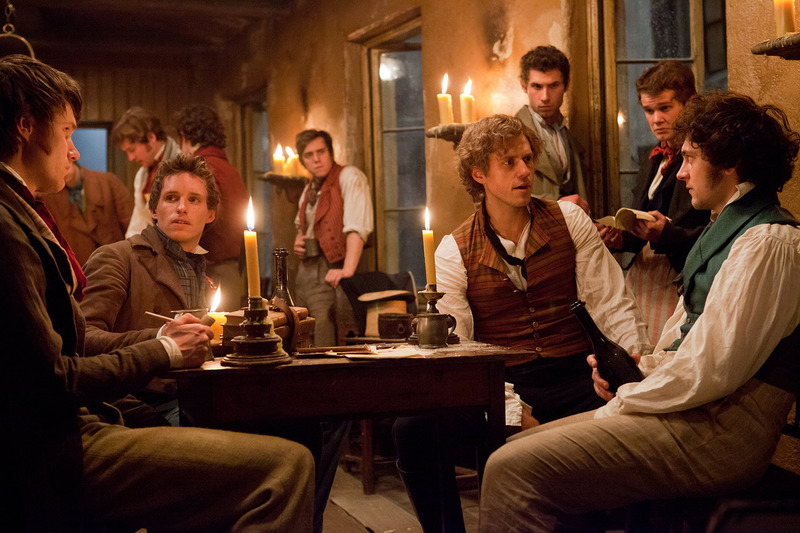 Another strength of this film is the way it depicts the rebellion led by Enjolras. The passion these young men have for their cause jumps off the screen, and it makes their deaths even more heartbreaking. I loved the placement of “Do You Hear the People Sing?” as the rebellion begins; it gave me the best kind of chills to watch the moment build with a sense of triumph. But that sense of triumph is all too soon overtaken by a sense of incredible tragedy. Hooper never lets you forget that these are boys, friends united by a brotherhood of purpose. They feel real—you can see the courage of conviction in their eyes but you can also see the fear in their body language. When Marius sings of his grief for all of his friends, you believe it because you could see that friendship, that brotherhood, in moments big and small. Weaknesses: The most glaring weakness in the film is Russell Crowe’s performance as Javert. He isn’t a bad singer, but he is overmatched in all of his duets with Jackman. And he seems to focus so much on his singing that he loses so much of the power that is necessary for his character to have any real impact. “Stars” should be an impassioned statement of conviction, but instead it falls flat (literally at some points when it comes to the vocals). Plot-wise, I’ve always had trouble buying into the romance between Marius and Cosette. Love-at-first-sight stories aren’t really my thing. Though Redmayne and Seyfried do their best to sell the joyful passion of young love, I still have trouble believing that their love is so all-consuming to Marius because it has so little time to develop into something that feels real. Musically, I found myself surprisingly disappointed by one of my favorite songs in the musical, “One Day More.” When I saw it onstage, it made me cry from the sheer power of the music, but in the film it doesn’t have that same impact. I think that the medium actually serves as a detractor here; there’s something about the sight of the whole cast onstage together as the red flag begins to wave that can’t be replicated by Hooper’s shots of each character singing their parts. I wanted chills, but I didn’t get them. However, I got my chills unexpectedly a moment later during “Do You Hear the People Sing?” so I suppose it all evened out in the end. Final Verdict: Les Misérables has its flaws, but, as I walked out of the theater after each of the three times I saw it, I wasn’t thinking about those flaws. Instead, I was thinking about the emotional impact this film was able to have on me. I cry a lot during movies, but very few of them turn me into a sobbing wreck like this one did. But the best thing about Les Misérables is that the tears were caused by the beauty and hope of the ending and not by the sadness that came before. It might not be a perfect film, but I would go see it for a fourth (and fifth) time in a heartbeat. This entry was posted in Film, Nerdy Girl Goes to the Movies and tagged film, genre: drama, genre: musical, oscar contenders by Katie. Bookmark the permalink.